Many thanks to Carol at May Dreams Gardens who invites gardening bloggers to post photos of what's blooming in their gardens on the 15th of each month. As I strolled out to my parched garden this evening, which is taking a Herculian effort to keep it watered nowadays, I was surprised at the number of blooms I found. Not a lot mind you, but anything that can bloom in this hothouse is worth mentioning. Lantana 'Miss Huff' snubs her nose at those who say that pink and orange don't mix! 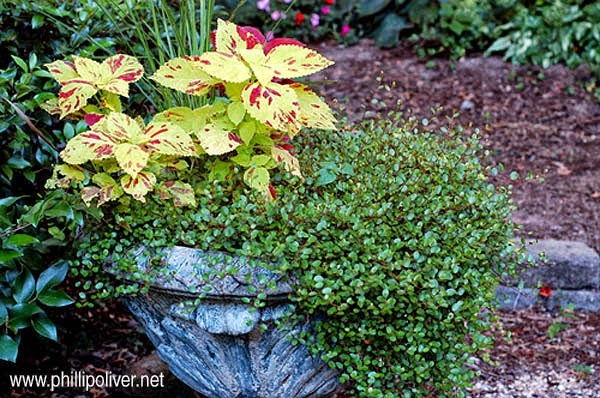 A container with coleus and creeping wire vine (Muehlenbeckia axillaris). I really enjoyed the stroll through your garden. You have some beautiful blooms, and wonderful shots of them! It seems that after you do a Bloom Day post I have an overwhelming urge to go shopping! Last month it was the Black and Blue salvia. 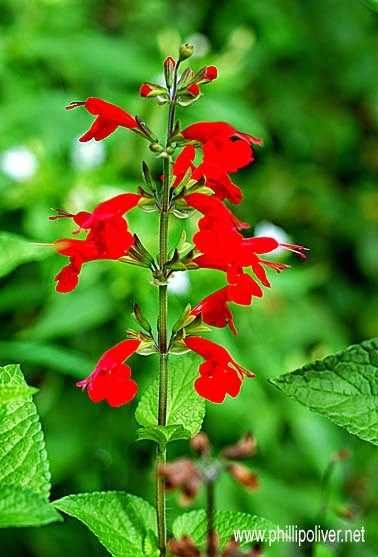 This month it's the red salvia...and the lilies...the lantana. Great post Phillip! Seems you have lot going on in your garden even without the rain that you much need. I'll give you a big Amen on the four o'clocks. I've been trying to get rid of those things for thirteen years. I'm just about to get there. Your blooms are gorgeous. Just thinking about the fragrance of the stargazer makes me want to plant them again. I had them for years but they died out for some reason. 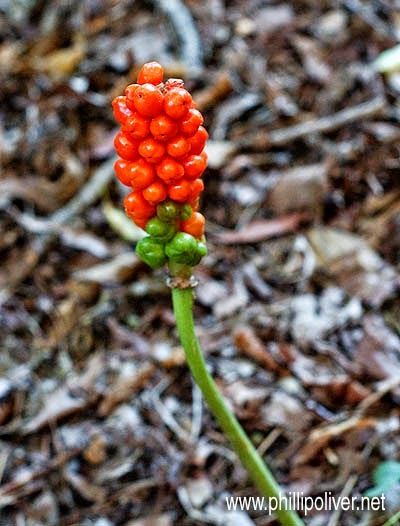 Another mystery in my garden is that the Italian Arum has only had those berries twice int he years that it has been in the garden. I always wonder why. Phillip... 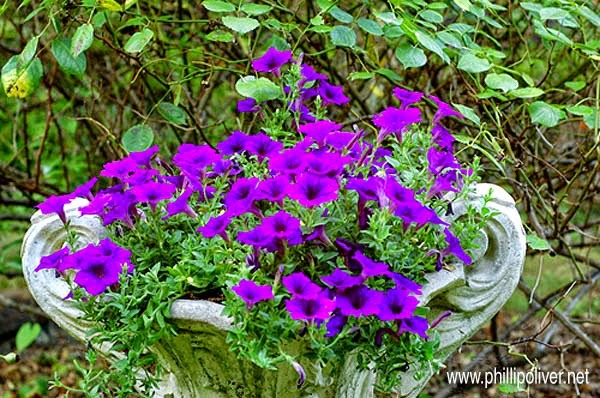 Looking at your lovely photos and all that bloom makes it hard to believe there is still a drought in AL! You must be dragging the hose around a lot! Happy Bloom Day and may you get rain, soon. I almost forgot it was bloom day! Will have to go out with the camera. Your blooms are beautiful! Lovely list of blooms. I really like the red salvia, and also the 'Stargazer' lilies... still my favorites. Very nice photos - I can smell the Stargazer from here. Have the beetles enjoyed Harry? Great pics, and I love Asiatic Lilies! Lovely July blooms, Phillip. How is the drought situation down there ? Great flower photos as usual. 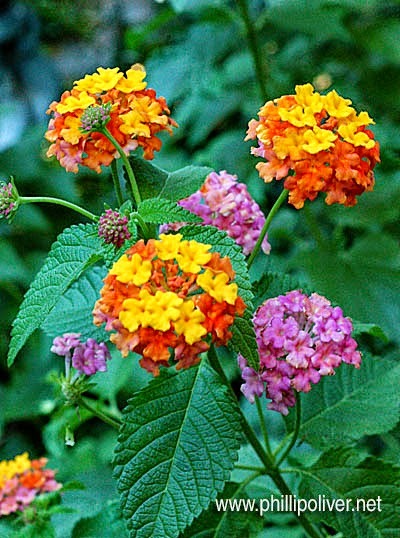 Love the lantana. Happy bloom day, a few days late. I'm still working my way around to see what everyone has blooming. Your blooms look great and the pictures are amazing. I aspire to have such a wonderful garden. Thanks for joining in! Aww, I must have :( I really wanted him to do it because I knew he'd do a good job & I want to support his shop. But I worried that if I didn't do it that day I wouldn't have the guts! Next time I'll call and schedule something. I love Euphorbia corollata! 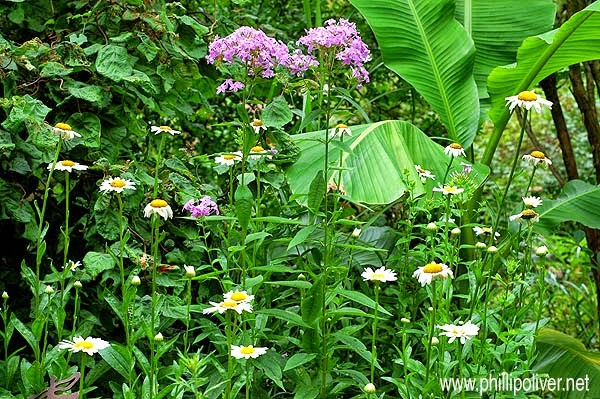 When I was planning my front prairie plant garden I looked everywhere & couldn't find it. I've seen it now in the Plant Delights catalogue & a few other places. I can't understand why it's so hard to find. It's such a great plant. I didn't realize it would grow so far south. You've made a good showing for Bloom Day in spite of your weather difficulties. Here's wishing you some rain! 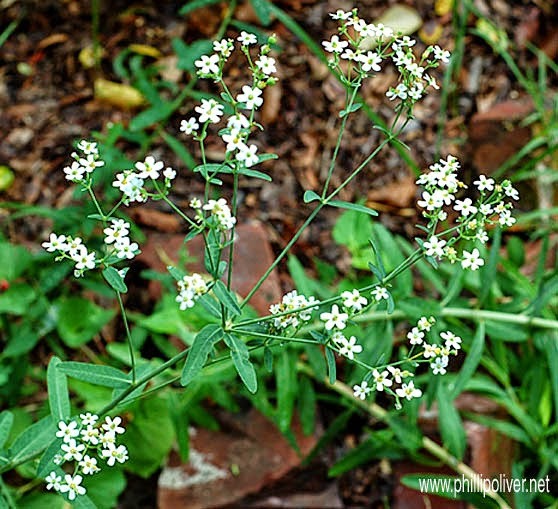 MMD, I first read about that plant in Pam Harper's book and it took me a long time to track it down. I forget where I ordered it from but was so glad to find it. Great pitctures Phillip. Love the lillies. Mine are just starting to bloom here. I understant about trying to keep the garden watered. I had the same problem until we installed the sprinkler system. So much nicer now. 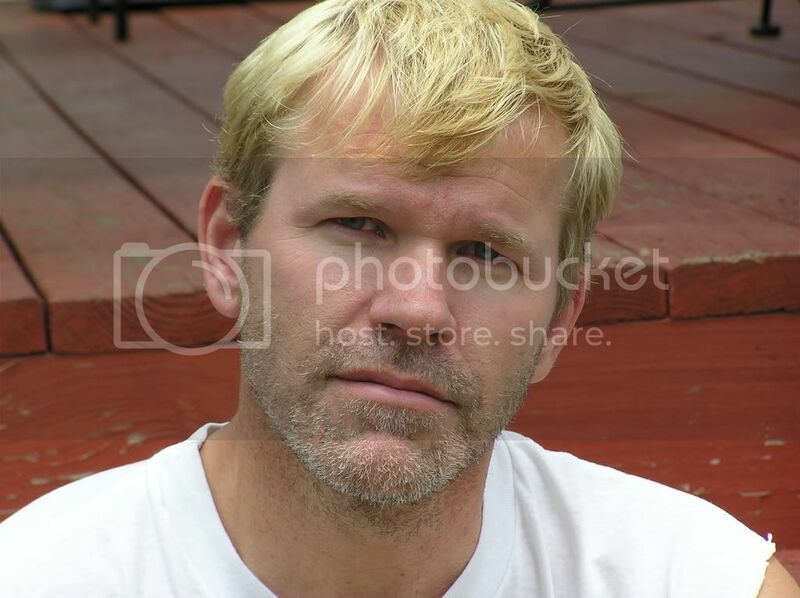 Your garden looks really enticing,Phillip! And I LOVE pink and orange together! With red and purple thrown in for good measure! (Think Mexico!) And I fully understand about keeping things watered! I am usually watering twice a day at this time of year! Postscript: a) thank you so much for adding Plant Whatever Brings You Joy to your blogroll. Beautiful shots, Phillip! I can just smell the scent from that gorgeous stargazer lily. The last three are blooming in a pot on our front porch.